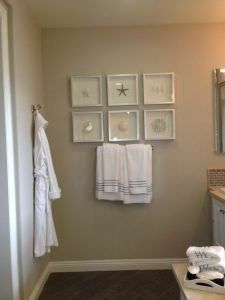 Coastal bathroom décor – main differences from the ocean décor. Do you dream about the cruise to the most far sees or you just want to feel the vacation atmosphere during the whole year? But what if you are planning your vacation for a really far future as you are one of those citizens who can’t just leave everything at the moment and go towards the life adventures, but you want to feel them already right now? Then we can allow you to get into the world full of the sea shells, palm leafs and the ocean waves already right now. How? 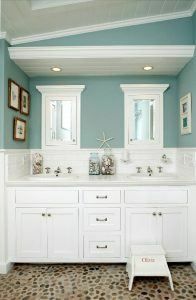 Just follow our instructions to get a perfect bathroom decorated in the coastal style. 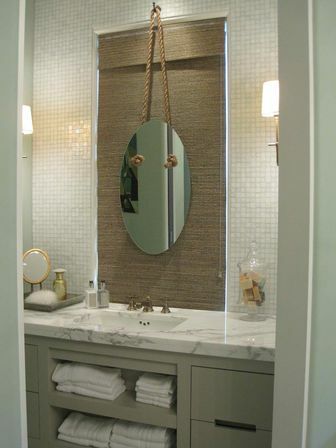 The coastal style of the bathroom decoration gets more and more popular. While planning to change the whole bathroom into this kind of style you should also carefully think about the whole color gamma, the needed accessories and the bathroom furniture. 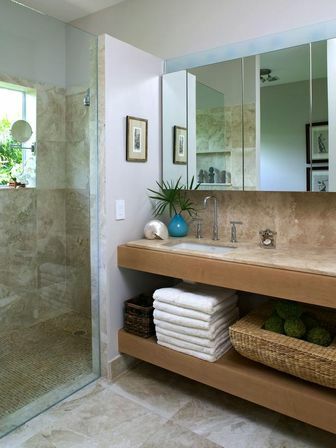 The bathroom made in a costal style is a perfect solution for those who want to leave all the stress of the daily life outside and get a perfect rest at the bathroom being totally relaxed. 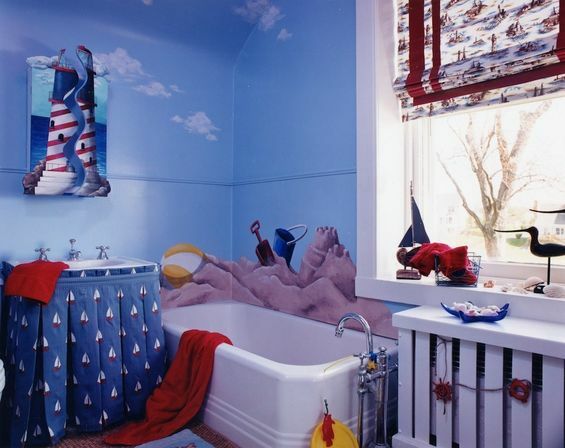 By coming into this bathroom you will be able to leave into the other world: to relax in the bath with the sea salt while listening to music imitating the water falling or the sound of the surf. 6 main costal colors gamma. You can get a whole unbelievable adventure atmosphere if you know how to smartly mix those colors. So if you get this technique than just by coming into the bathroom you can get a feeling of the being on the ship that goes far away into the sea or you can feel yourself laying on the sea coast. You can be sure that all your guests will be definitely surprised by the new bathroom interior that is actually so easy to turn from the standard easy looking to the whole Islam in the house. 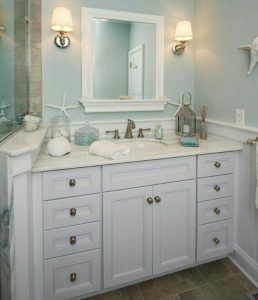 Actually there is a whole mass of varieties how you can decorate your bathroom made in coated style and which accessories you can choose for this. 8 main nature elements that can be used for the coastal bathroom decoration. The peddles or the other rounded stones with the smooth surface. The pieces of the wood reminding about the crashed ships. The bottles with the small ships in there. The fishes and so much more. All of this will definitely help you to make the atmosphere of the sea coast and the long sea traveling all around the world. 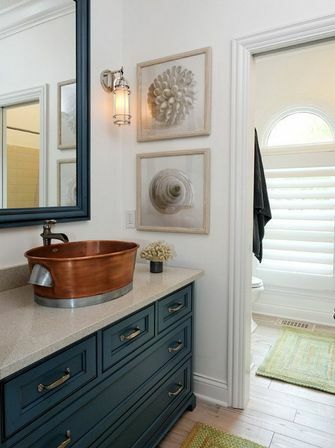 But also pay your attention on the fact that it’s not necessary to put all the accessories at the same time as it can make your bathroom looking overloaded and won’t talk good about your taste. The coastal bathroom decoration materials. 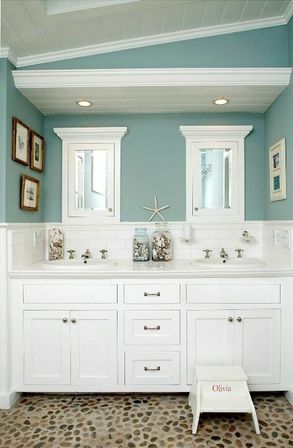 To change the bathroom into the piece of the coast you also need to carefully choose the color gamma of the future costal bathroom same as you need to pay your attention on the materials you gonna make it with. 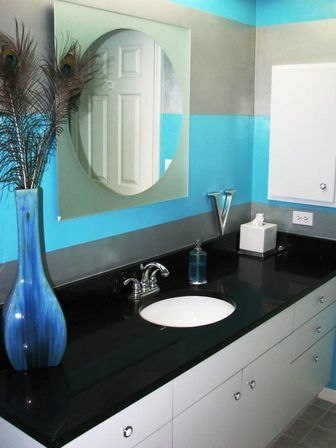 To decorate the walls you can definitely use the ceramic tile made in a turquoise, blue or the sea wave color. It can be all made in the single gamma or you can mix it with the sent color ceramic tile inclusions. 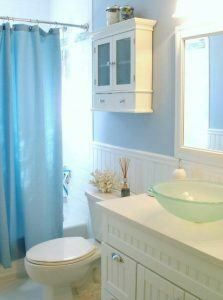 If you prefer more classical interior than you should definitely stop your choice on the bathroom made decorated in blue and white color. 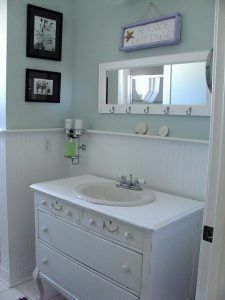 Also don’t forget that the ratio of the colors should be proportional to the bathroom size and the smaller it is the more light shades you should use. It’s gonna look really beautiful if you combine the mosaic and tiles of the different shades, but will keep it in the same color range. Here you can experiment with such colors as light blue, turquoise and dark indigo color. Being places chaotically it’s gonna remind you about the waves play. 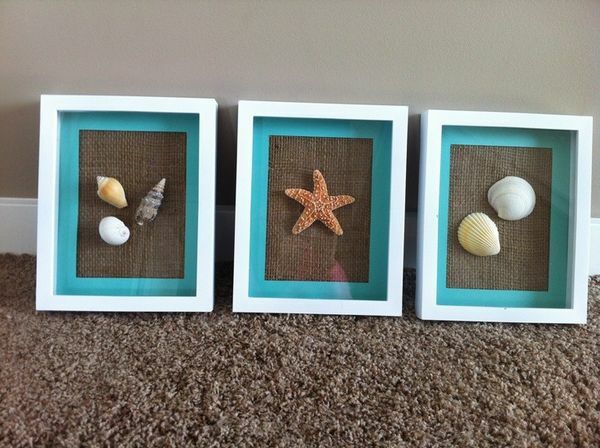 You can decorate one of the free walls with the painting made in a sea style, fresco or even buy the mosaic picture with the sea motives on it. One more interesting solution for the costal bathroom is the fake porthole establishing where you can see all the underwater life going. The ceiling will look good being painted into the white or the light blue color. It’s also gonna look good if you will decide to establish the mounted construction with the sky motives on it. The floor can be made with the moisture- proof wooden panels that can be even colored like the old ship’s ones r you can even make a hand-made paddle bathroom carpet that won’t be just an interesting bathroom decoration by will also provide you with the perfect daily massage. But don’t forget if you can’t get the paddles now or you just simply don’t have time to do all this because nowadays you can easily find it online in the hand-made shops or just buy the ceramic tile that imitates the sea peddles and shells. So now you can see that most of the interiors made in a sea theme style has the same range of the advices and all you can do is to listen to your own preferences and make the visual accents you want. So we wish you luck and not to forget to collect the peddles in the closest beach! 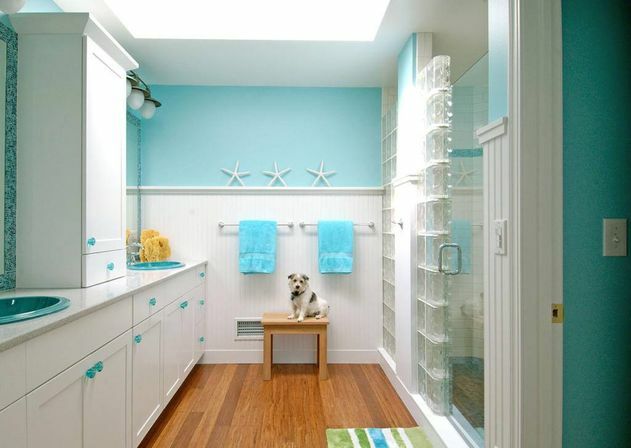 Turquoise bathroom decoration as the most popular bathroom solution of this season. Lighthouse bathroom decor for the bravest experimentors. 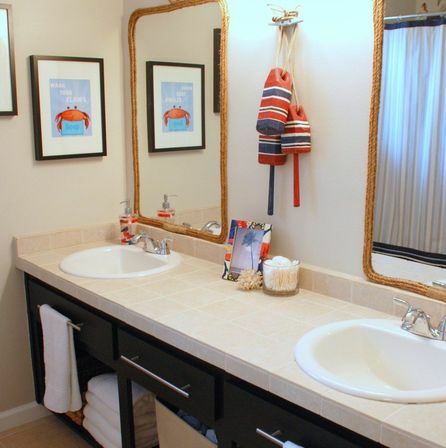 Cute bathroom decor and it’s interior features.